The thing is though, I get excited when I try a recipe and it works, like, it really works, like it works so well that while the cake is still in the oven, Alessandro gets off the sofa and suggests we go to the gym because the toffee-like smell coming out of the oven is too much for him to bear while not being able to eat any of it (which must be said came at the end of a long Sunday that started with a 9.30am coffee date, involved a trip to IKEA, more boxes being unpacked and a load of laundry). 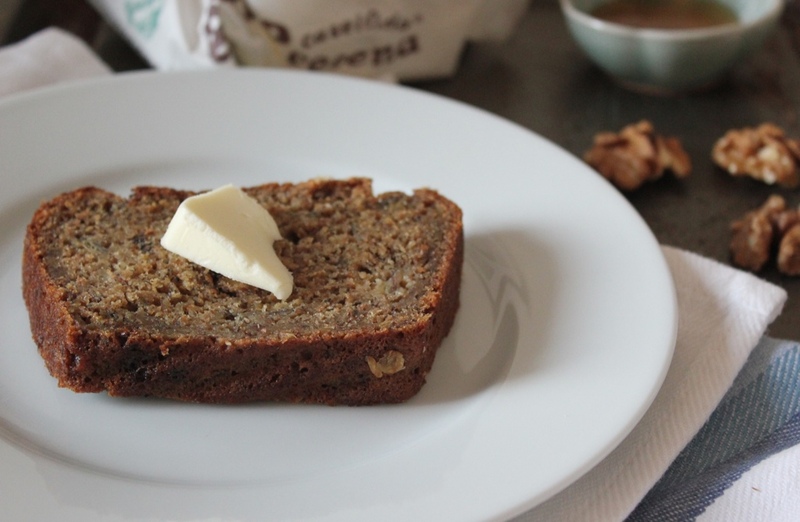 So yes, while technically this is another banana bread recipe, there is really very little that the loaf I presented you with last week and this one have in common. 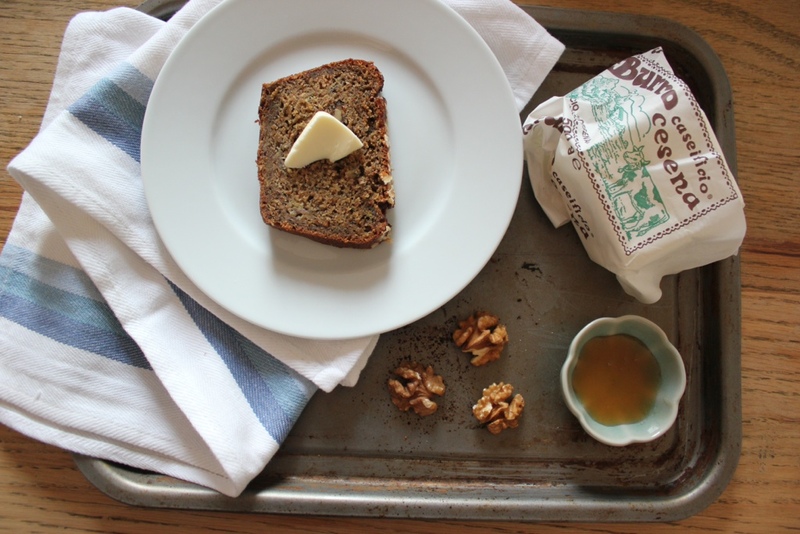 And all it seems to boil down to is the use of browned butter (or beurre noisette). I have seen browned butter used in a number of recipes recently with everyone raving about the toffee-like flavour and depth it adds to baked goods. I was immediately convinced that it would work spectacularly well in chocolate chip cookies. But alas, given my new-discovered love for all things pasta and pizza (read: refined carbohydrates), I feel like I should not make my morning gym session completely useless by also munching on cookies everyday (although I am itching to try baking chocolate chip cookies using browned butter – I guess I could always take the excess cookies to work …). 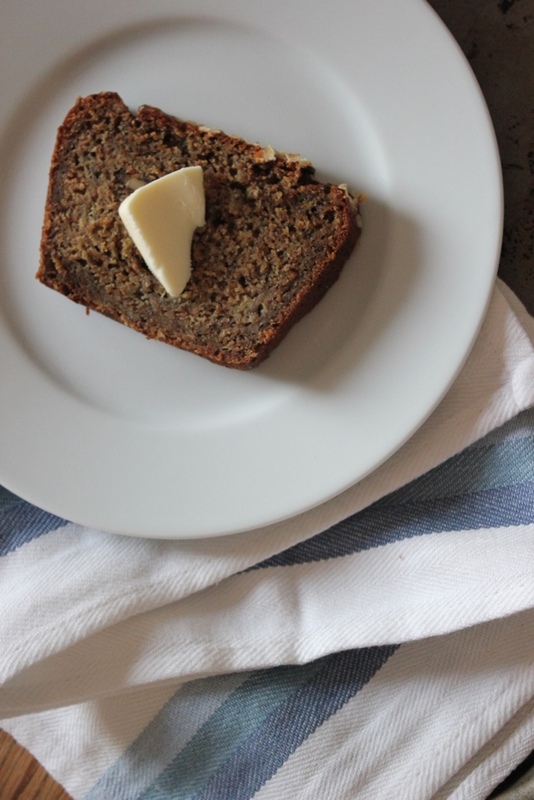 And then it occurred to me to try the banana bread recipe from my new Peyton and Byrne book (because you can never have too many banana bread recipes on rotation), use browned butter and see what happens. *If you don’t have any buttermilk to hand, you can substitute this by using 30ml full-fat milk and 30ml plain yoghurt. Otherwise, you could make your own buttermilk by adding a squeeze of lemon juice to 60ml full-fat milk. Don’t be tempted to substitute with just plain milk – bicarbonate of soda is an acid-activated rising agent so will need the acidity from the buttermilk (or some other form of acid) to start working! 1. Start by browning your butter: place the butter in a small sauce pan and let the butter melt on a low to medium flame. Wait for the butter to brown (being careful not to burn it) – the butter is ready when it is chestnut brown in colour and smells nutty. Set aside to cool then place in the fridge to solidify (it should still be soft enough to cream). 2. Pre-heat your oven to 170 degrees Celsius. 3. Place the butter and sugars in a bowl and beat until light and fluffy. 4. Beat in the eggs, one by one, until fully incorporated. 5. Mash the bananas and combine with the buttermilk. Fold into the egg-butter-sugar mix. 6. Combine the flour with the salt and bicarbonate of soda and the walnuts (combining the walnuts with the flour will prevent them sinking to the bottom of the loaf pan). 7. Quickly combine the flour mix with the egg-butter-sugar and banana-buttermilk mix. 8. Grease a large loaf pan and pour in the batter. 9. Scatter the oats on top of the batter. 10. Place in the oven and bake for ca. 60 minutes or until a skewer inserted into the middle of the cake comes out clean. … and what happens is a revelation – toffee and banana are an obvious combination (Banoffee Pie anyone?) which is why I like using brown or demerara sugar when baking banana bread. But the browned butter really rounded out the flavour – the bread actually tastes as though you used some dulce de leche or butterscotch sauce in the recipe. 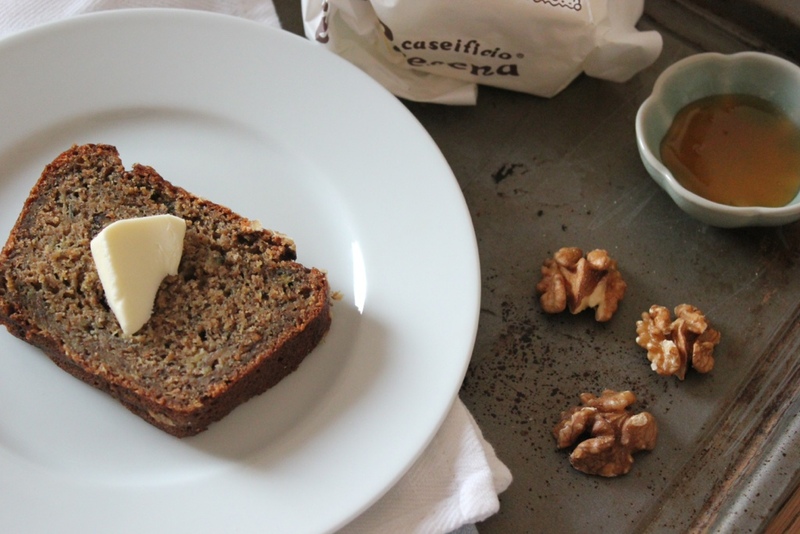 It is much richer than my typical banana bread I posted about the other day, yet this is also a wholemeal recipe and does not include any additional sugar or butter – in fact I reduced the amount of sugar from the original recipe by 25%. Pretty, simple and delicious – just how I like my food 🙂 Great snaps too!